"Lytro will introduce the first light field camera that allows consumers to instantly capture interactive, living pictures and then focus them AFTER they are taken." 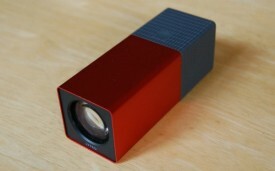 The Lytro looks very fun, great design. You need to click on the pictures in the galleries linked to below and watch the pictures change focus. Pretty cool! How very, very interesting. I had no idea these existed. You bought one Sharon? Would be keen to hear how you find it if you have! Looks like it'd be great fun. Reckon it'll be great for a lot of things, but I think the best thing is being able to set up shots that tell different stories depending on where you focus: post the image so that it can be refocussed afterwards by the viewer. From what I understand the only way to do that at the moment is to do it through Lytro's own website? If you could do it anywhere - Flickr, here - then it'd be a lot more attractive! I'm not sure about it only being hostablable / viewable on the Lytro site, if so...well... I'll wait for that limitation to pass! Or John, surely temptation has seen you get one of these!!?? Another camera gadget that has caught my eye - the Tamaggo one shot panorama camera. Take your pick from these..